Hi there. We’d like to take a break from our regularly scheduled movie news and information to bring you some amazing fan art by Nate Hallinan (via Comic Book Movie). 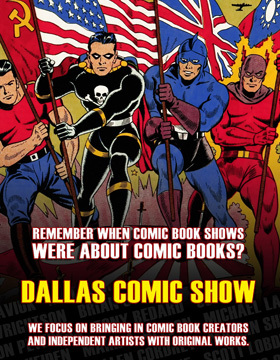 In the comics, Marvel has been known to do alternate reality stories like the 1602 and Marvel Zombie’s. 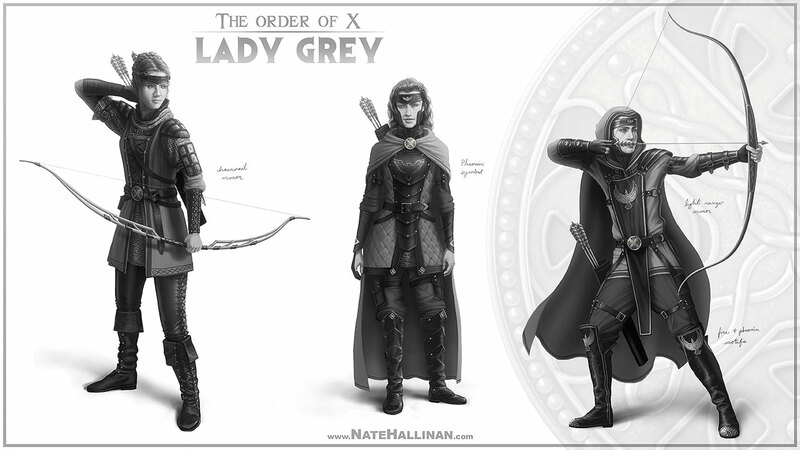 Much in that same vein, Nate has created a fantastic look at many of the X-Men characters as Medieval characters as part of the Order of the X. Not to be content with just creating amazing visual depictions, he also went to great lengths to even provide Medieval backgrounds for each of his creations (as well as provide personal insight to each of them). Take a look at them below and let us know, which one is your favorite. You can catch more of his work by clicking on the links below. 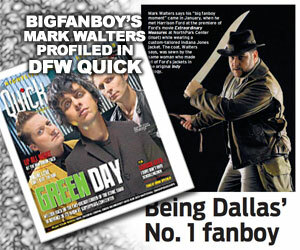 Be sure to click on each of the images to see them full size. A group of ‘gifted’ individuals in the service of Lord Charles Xavier. 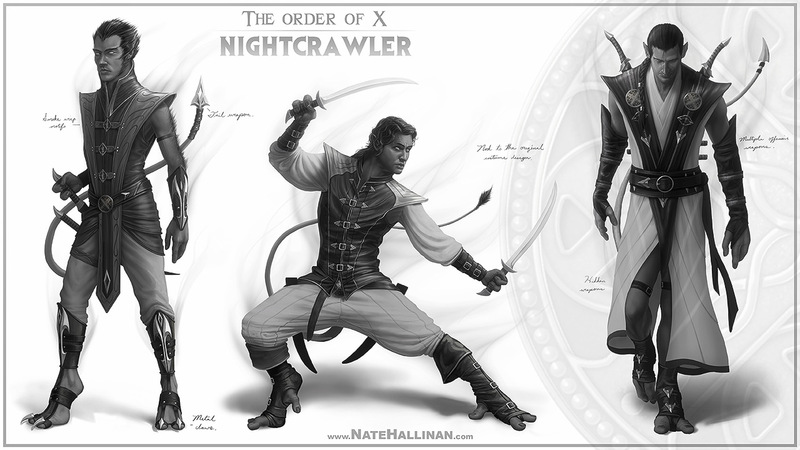 The Order provides sanctuary and protection to individuals outcast by society due to their innate abnormalities. These people are often miss-labeled as monsters, demons, warlocks and witches. Only those who are accepting of the ‘gifted’ are welcome to the realm of Lord Xavier. This is a personal fan-fiction variation on the X-Men. 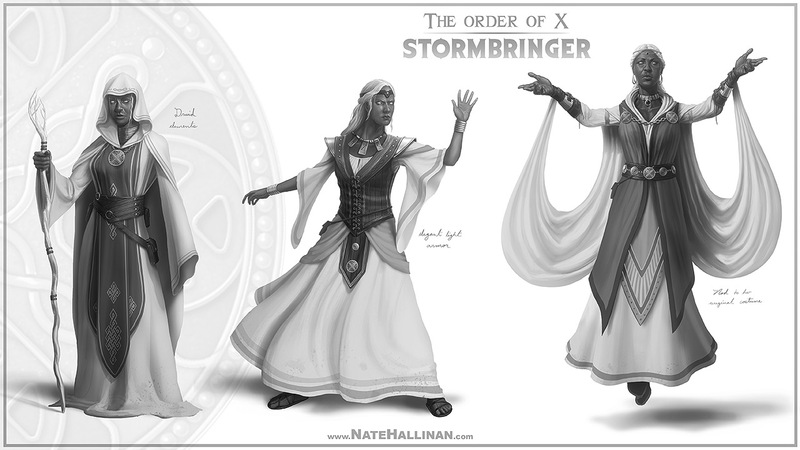 I thought it would be a fun exercise to do the X-Men in an alternate medieval/fantasy reality. Prejudice and discrimination were rampant in our history. Being a darker and less civilized time, fear and hatred ran deeper making it an interesting setting for the X-Men. The quest to protect and defend the ‘gifted’ would be near insurmountable. 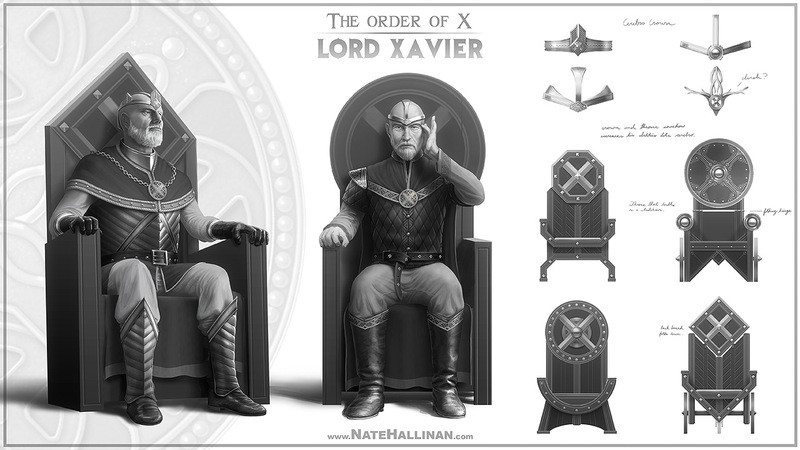 Lord Charles Xavier is the lord and founder of The Order of X. Charles developed the abilities to read, control, and influence human minds. He formed The Order because he saw and felt the injustice happening to the ‘gifted’ people around him. Understanding his role he felt that it was his noble duty to protect these people. Scott and his younger brother were both orphans who grew up fending for themselves on the streets. The day Scott’s ability manifested he accidentally destroyed several buildings and set fire to half the village. 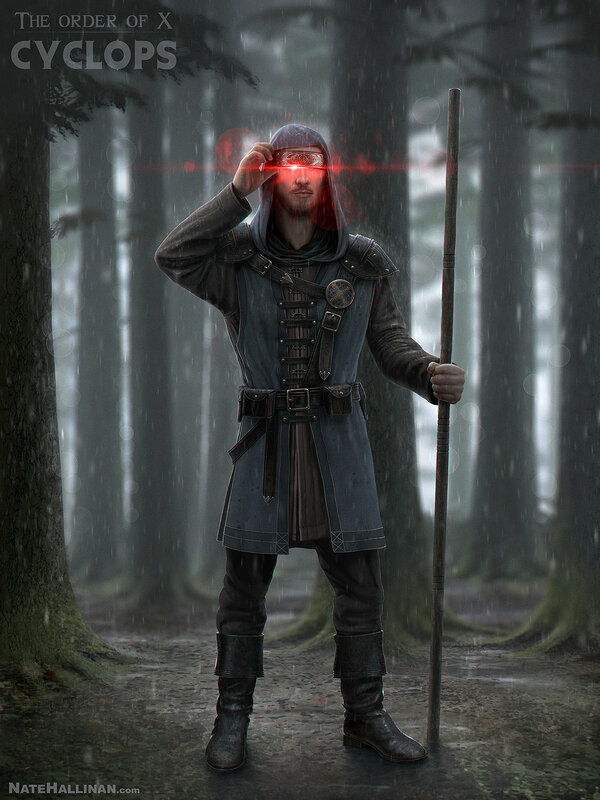 In the chaos of everything Scott lost sight of his brother for he couldn’t open his eye without causing more destruction. Xavier, perceiving the trouble, quickly dispatched members from his order to rescue Scott. Scott has the ability to emit a destructive beam from his eyes. He has learned, for the most part, to live without his sight. He wears a protective blindfold that keeps him from opening his eyes as well as from being easily removed. Needing to cover his eyes all time, people have spread rumors that he is actually a cyclops with a magical destructive eye. 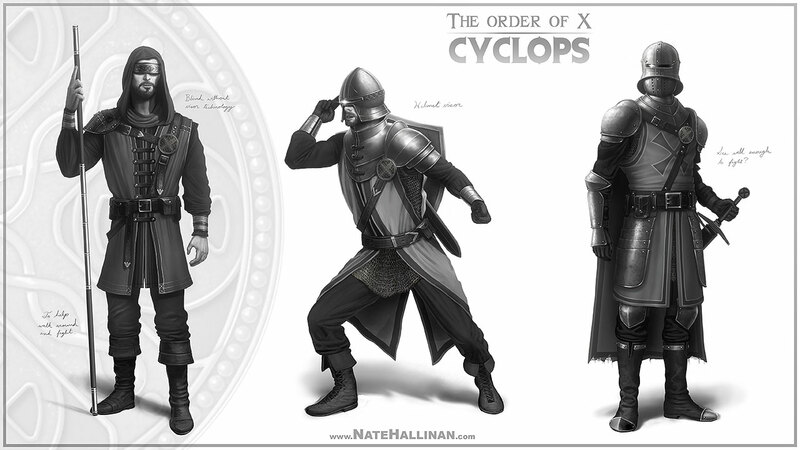 False as this may be, he enjoys being called Cyclops; striking fear in his enemies. (Personal notes) Cyclops was a serious conflict for me. It just didn’t seem realistic that they would have the ability to make a functional visor for him in a time period like this. So I thought, what if hes just blind for the most part? Only using his ability for those ‘Hail Mary’ moments. Jean and Scott could grow close together needing her assistance on and off the battlefield. He could somehow fill the ‘blind-wise’ leader role. 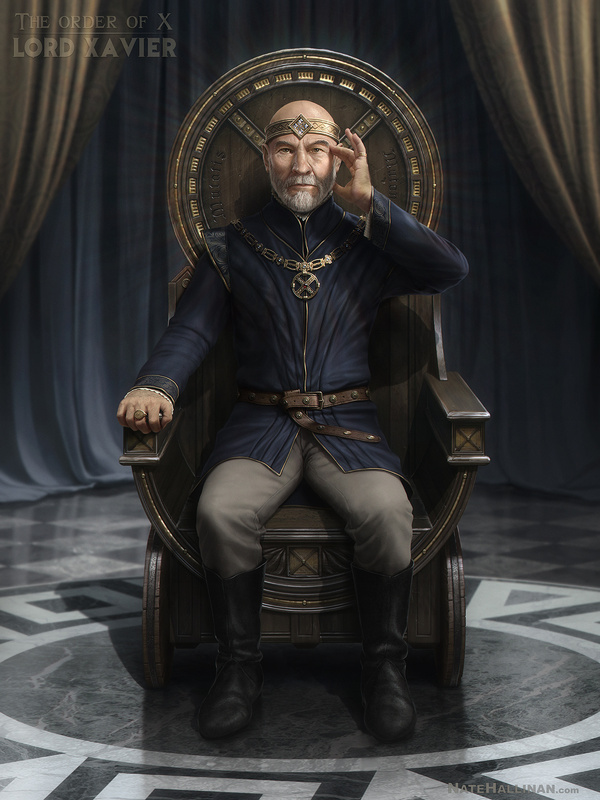 (Henrick McCoy) Henrick’s mind is a fierce as his appearance. Henrick was coined the name “Beast” as a more ironic term of endearment. He is loved by his peers and is one of most wise and trusted members of Xavier’s council. He is well educated and continues to be a scholar of many disciplines. 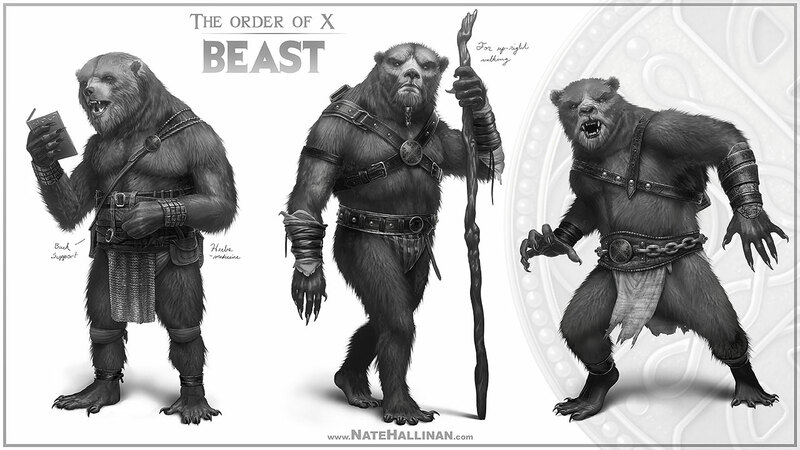 (Personal notes) There are several versions of Beast in the Marvel universe, but I thought it would be fun to do my own and make him more bear-like. 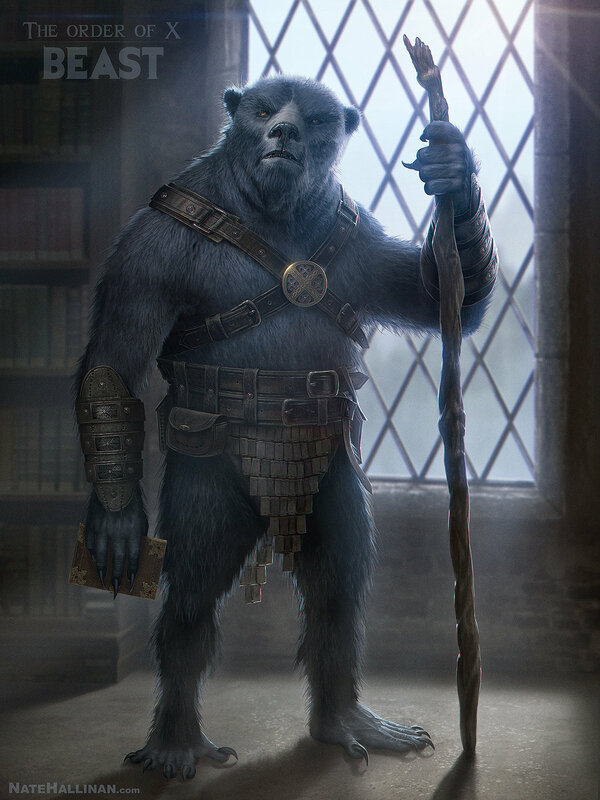 Beorn from The Hobbit has always been an interesting character to me so I took the chance using him as an influence. The challenge to figuring out Beast’s appearance is making him seem intelligent as well as wild. Quite a challenge with these polar characterizations. The mountain of metal; Colossus. By happenstance, he developed the ability to cover his body in metal and increase his strength. He discovered his abilities in his youth when his younger sister became trapped under a collapsed cart. When villagers witnessed his transformation they became frightened. Thinking that Peter might be some monsters, a mob formed and came after him and his family. They couldn’t harm Peter but he couldn’t protect his family without harming the villagers. Peter and his family were driven from their home but they found refuge in the land protected by Lord Xavier. 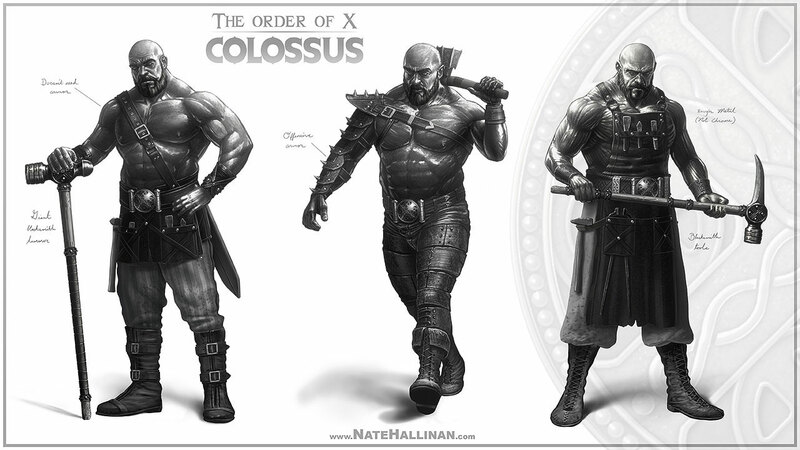 (Personal notes) I didn’t want Colossus to have the typical perfectly sculpted bodybuilder look he usually does. I wanted his form to come across as though he gained it from hard labor. The best reference were guys from strongman competitions. His name is after all is Colossus, so I not only wanted him to be mountainous in muscle but pretty thick as well. I also thought it would be cool to make more iron (not chrome) giving him a darker, rough, natural look. 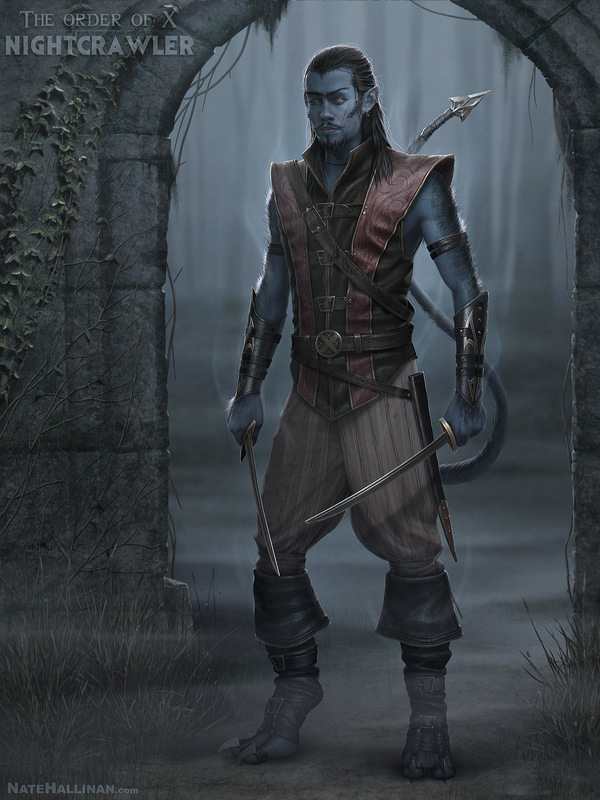 (Kyrt V’wagnyr – Roughly translates from elven as Nightcrawler.) Kyrt never knew his real parents. He was found by a band of elves as an infant. They were on a twilight march, celebrating the new moon, when they found him crawling next to his basket on a riverbank. They happily adopted him seeing that he was part elf. His enchanting midnight appearance and mysterious abilities makes him highly regarded among elves. 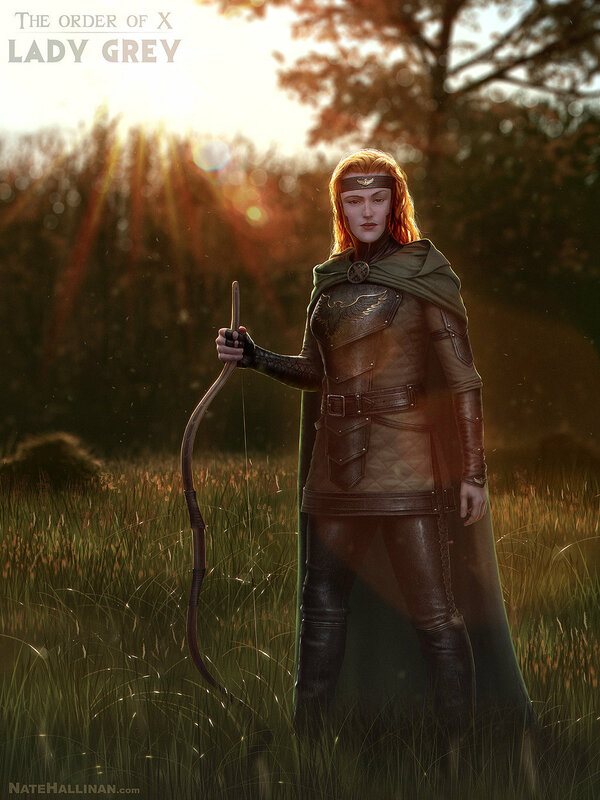 Magic runs deep in the race of elves but Kyrt’s abilities are more potent than most. Loghand is just another grouchy dwarf but he has a special ability to quickly heal. 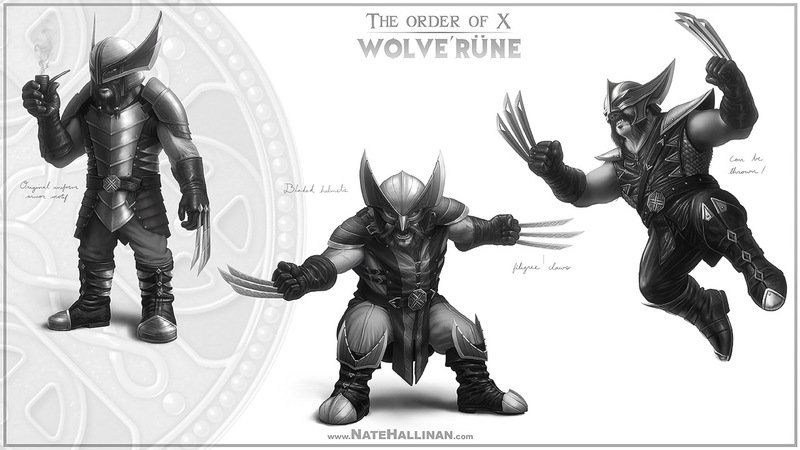 He earned the surname, Wolve’rüne, with his fierce temperament and his odd ability to return from battles unscathed. The name roughly translates from dwarvish as the ‘The Stone Wolf.’ Stone and earth being long lasting and enduring, while wolves being ferocious ill tempered beasts; thus the name Wolve’rüne. Wolve’rüne’s past is a mystery for he doesn’t even remember it. His earliest memory was being dug out from a cave-in by his dwarf clan. Having no injuries and an already suspiciously long life, the dwarves feared he was either cursed or meddling in the dark arts. 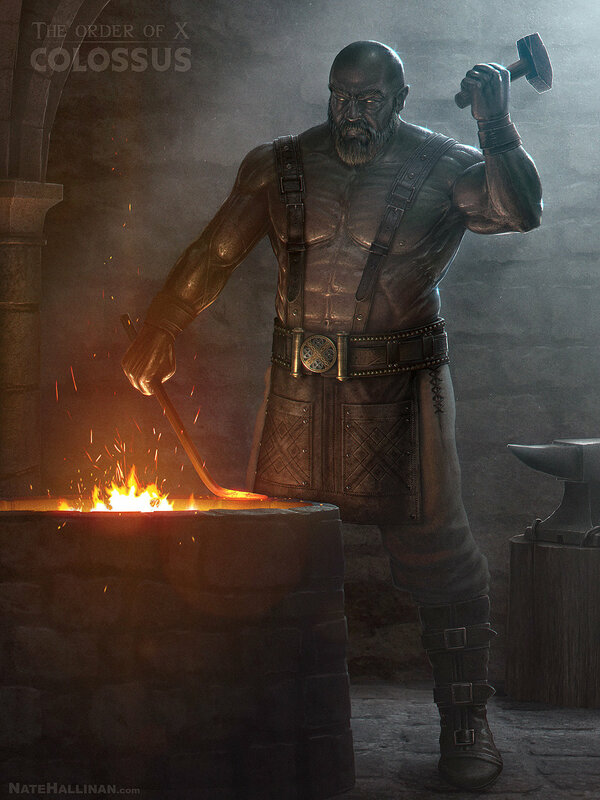 Due to this event and strict dwarven law he was promptly judged and exiled. Refusing to speak to him in any manner, they mercifully only told him his name. 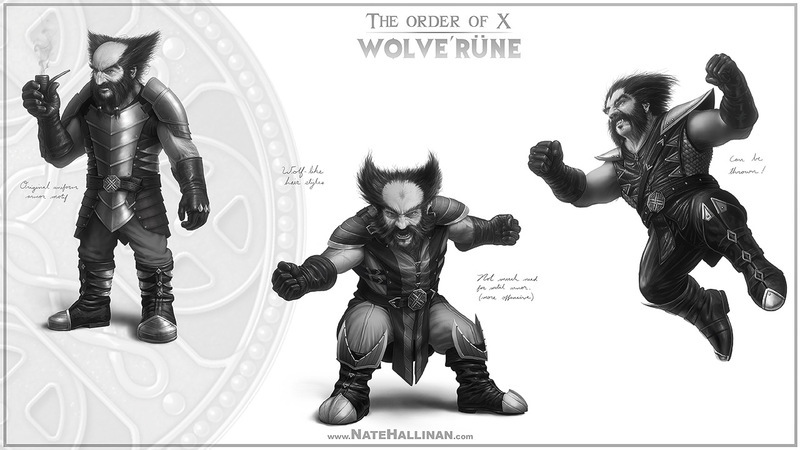 (Personal notes) Making Wolverine a dwarf seemed so fitting especially with his famous demeanor and already being short in the comics. A dwarf with a short-man syndrome just seemed to give this character more justification. His name is absolutely ridiculous but I love that and Dwarves often have such literal names. His crazy hair and costume also played well into popular dwarf iconography. 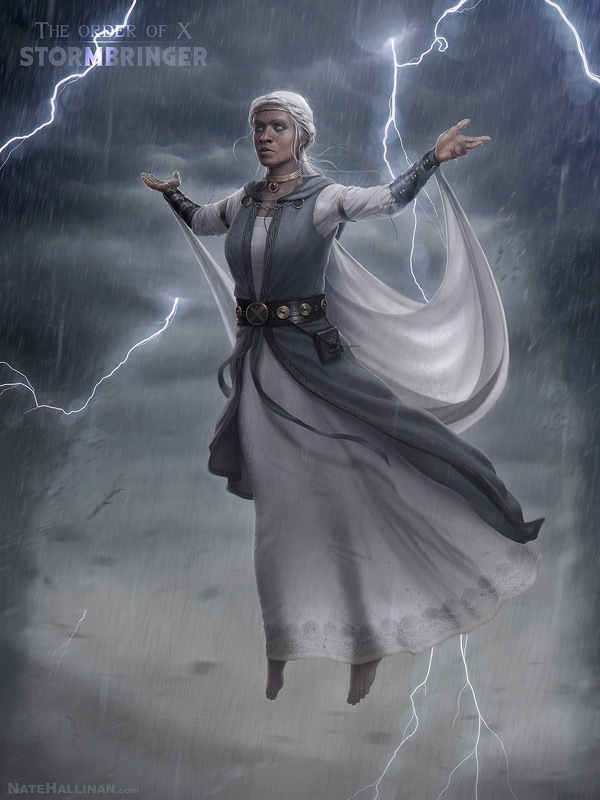 Outstanding paintings + well-thought-out concepts! This would make a really interesting Marvel limited series, or… A fresh film! !